WINSTON, Ga. — Austin Hill has partnered with Young’s Motorsports and will run 12 races in the NASCAR Camping World Truck Series this season. Hill, a former competitor in the NASCAR K&N Pro Series East and NASCAR Next alumnus, will take the wheel of the No. 02 Ford F-150 for 12 races this season, beginning with this weekend’s Active Pest Control 200 at Atlanta Motor Speedway. The Winston, Ga. native has one previous start at his home track, coming last year, when he started 23rd and contended in the top 10 before finishing 12th. Don Rich Ford, one of Georgia’s premier Ford dealers, will adorn the No. 02 truck as the primary sponsor. The dealership, located in Villa Rica, has been a longtime supporter of Hill, dating back to his run in the Legends cars and K&N East ranks. Alien Gear Holsters, Lawless Jerky and The Lone Survivor Foundation will also adorn the sides of the No. 02 Ford F-150 during the season. A render of Hill’s No. 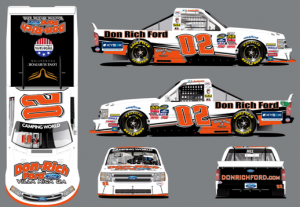 02 Don Rich Ford entry for this weekend’s race at Atlanta Motor Speedway. Tyler Young piloted the team’s entry at Daytona International Speedway, contending with the leaders before being collected in an early incident, and will drive the remaining 10 races on the schedule that Hill does not compete in.